There have been a number of recent developments in the treatment of castration-resistant prostate cancer which seek to exploit the hormonal axis. Still, the castration-resistant prostate cancer remains a major challenge since this is the lethal and incurable phenotype which results in tens of thousands of deaths every year. There has been emerging interest in utilizing anticancer immunotherapy in prostate cancer, especially since the development of sipuleucel-T. Several other prostate cancer therapeutic vaccines including autologous and allogeneic vaccines, as well as viral vector-based vaccines, have demonstrated promising results in early trials. The checkpoint inhibitors which have shown some dramatic results in other cancers are now being studied in advanced prostate cancer setting. Studies are examining the therapeutic effects for both CTLA-4 inhibitors and PD-1/PD-L1 inhibitors. It appears that definitions and measurements of response used in cytotoxic therapies may not be valid in determining response to immunotherapy. Early reports suggest that combination therapies, either concurrent or sequential, may be needed to achieve the desired response against advanced prostate cancer. The worldwide incidence of newly diagnosed prostate cancers is estimated to be 1.1 million cases, annually. While the majority of patients are initially diagnosed with localized or locally advanced disease, especially in countries where prostate-specific antigen (PSA) screening is widespread, nearly 1/3rd of patients will experience disease recurrence. In countries where PSA screening is not widely adopted, the incidence of metastatic prostate cancer at diagnosis is significantly higher. While metastatic prostate cancer at initial diagnosis is almost always sensitive to hormonal manipulation, the eventual emergence of castration resistance in this population results in the lethal phenotype termed metastatic castration-resistant prostate cancer (mCRPC). These patients have a median overall survival (OS) between 12 and 36 months. In the recent years, a number of new drugs have been developed and approved for clinical use in mCRPC patients including cabazitaxel, abiraterone, enzalutamide, and radium-223. These choices remain within the traditional scope of prostate cancer treatment: anti-androgen, chemothersapy, and radiation. While these new therapies have shown survival benefit, a significant proportion of patients will exhibit either primary or acquired resistance to these agents, resulting in a limited clinical response, both in duration and magnitude. Clearly, different treatment strategies are needed to improve the survival of men with advanced prostate cancer and mCRPC. Over the last 10 years, research into immunotherapy for the treatment of advanced cancers has led to some promising successes, specifically for melanoma, nonsmall cell lung cancer, and renal cell carcinoma. This has provided the impetus for further investigation into the value of immunotherapy in the treatment of prostate cancer. Since the development of sipuleucel-T, an autologous cellular immune therapy that stimulates a T-cell immune response against cancer cells, promising clinical trials of immunotherapy for other cancers have stimulated the interest in the development of prostate cancer-specific immunotherapies. Prostate cancer has several characteristics that make the immune response an important feature in cancer progression and an intriguing target for immune therapy. A number of different infiltrating immune cells have been detected within prostate cancer tissue, including natural killer cells, CD4+ and CD8+ T-cells, dendritic cells, and tumor-associated macrophages, all of which can be utilized to unleash host immune responses. The prostate also harbors multiple tumor-specific antigens, such as PSA, prostate acid phosphatase (PAP), and prostate-specific membrane antigen (PSMA), among others, providing antigenic targets for immune therapy. Furthermore, prostate cancer has slow growth kinetics, which reduces the effectiveness of the traditional chemotherapies but may increase the effectiveness of immunomodulatory approaches, which require time to mount an antitumor response. There is evidence to suggest that, despite the multitude of infiltrating immune cells and tumor-associated antigens, the prostate cancer microenvironment is in fact immunosuppressive in its effect. It is likely that the immune environment changes over time as the disease status changes and in response to treatment exposure., Manipulation of this inherent immunosuppressive milieu provides another target for therapy. In this article, we will discuss some current and emerging concepts in prostate cancer immunotherapy. There are two primary immune targeting approaches that seek to exploit the natural immune system to target the cancer cells: (1) antigen-targeted immunotherapy; (2) immunomodulatory immunotherapy. Within these broad categories are several more specific targeting concepts: immune checkpoint inhibitors, co-stimulatory antibodies, vaccines, adoptive cell transfer, tumor-infiltrating lymphocytes, oncolytic viruses, and cytokines. The primary focus of current prostate cancer research includes vaccines, which fall into the antigen-targeting group, and immune checkpoint inhibitors and T-cell regulatory drugs, which are classified in the immunomodulatory group. Sipuleucel-T is an autologous vaccine and a prime example of personalized immunotherapy. It is produced following the collection and processing of patient-derived peripheral dendritic cells (DCs) via leukapheresis. The DCs are then incubated in granulocyte-macrophage-colony- stimulating factor (GM-CSF) and PAP fusion protein (PA2024). After 36–44 h, the primed DCs are re-infused into the patient to generate a PAP-specific CD4+ and CD8+ T-cell response. This vaccine was studied in men with early mCRPC who were asymptomatic or minimally symptomatic. The IMPACT trial demonstrated an improvement of 4.1 months in OS compared with placebo, with a 22% reduction in the risk of death. Of note, no difference was noted in time to disease progression or in PSA response. The reasons for this are not clear but may be related to the delayed onset of antitumor immune response, an observation which has been repeated in later trials with sipuleucel-T, as well as other cancer immunotherapy trials. Multiple trials and long-term data have confirmed that this treatment is well tolerated with infrequent and mild adverse events. Since the treatment course is quite short (4 weeks) and side effects are mild, most patients can receive subsequent therapies. Sipuleucel-T has been used in combination, both as concurrent and subsequent treatment, with other therapies such as abiraterone. This approach appears to have no negative impact on the effectiveness of sipuleucel-T when used in combination with other chemo-hormonal agents. Ongoing clinical trials in this area involve combination studies of chemotherapy, anti-androgens, steroids, radiation, and other immune therapy modalities to further explore their potential for synergistic anticancer effects. GVAX is a GM-CSF tumor cell vaccine. Whole tumor cells (either autologous or allogeneic) can be used as a source of antigen and are modified to express GM-CSF, which facilitates the presentation of tumor antigens to antigen-presenting cells (APCs), specifically dendritic cells. The maturing dendritic cells stimulate and activate CD8+ T-cells, CD4+ T-cells, and B-cells for the antitumor immune response. The allogeneic GVAX utilizes two human prostate cell lines as the source of antigens, LNCaP (androgen sensitive) and PC3 (androgen insensitive), which are engineered to produce GM-CSF which facilitates recruitment and maturation of APCs near the injection site. An initial Phase II trial showed that PROSTVAC-VF increased the progression-free survival in 63% of men and significantly lowered the PSA doubling time from 5.3 months to 7.7 months in nonmetastatic prostate cancer. In a different randomized Phase II clinical trial in men with mCRPC, 125 patients with minimally symptomatic mCRPC were randomized to receive the vaccine or placebo. This study did not meet its primary end point of progression-free survival; however, the OS after 3 years was significantly improved (25.1 vs 16.6 months). This apparent discrepancy further supports the paradigm that immunotherapy may be associated with delayed benefits that may continue to develop after completion of treatment. The reported side effects have been minimal and are related to injection site reaction and fatigue or flu-like symptoms. Since this vaccine does not require personalization (as dose sipuleucel-T), the manufacturing and processing of this vaccine is less complex, which may facilitate easier distribution and access for the patients. Based on these encouraging results, a multicenter, international Phase III trial of men with asymptomatic or minimally symptomatic mCRPC for treatment with and without GM-CSF is currently ongoing with completion of patient accrual (NCT01322490). Other approaches to developing therapeutic vaccines against prostate cancer include DNA-based vaccines, which use a vector, such as plasmid, to encode tumor-associated antigens (e.g., PSA, PAP) to generate an immune response by recruiting APCs. Another approach involves personalized peptide vaccines, which are developed by first identifying which peptides are most commonly recognized by the precursor cytotoxic T-lymphocytes (CTLs), and then delivery of those peptides results in the activation of CTLs and an antitumor immune response. A different autologous-activated DCs vaccine approach has been studied whereby patients' DCs are pulsed with LNCaP cell antigens (DCVAC/PCa). In Phase I/II trials, it was well tolerated with modest antitumor immune response. A Phase III trial of this vaccine in men with mCRPC who are eligible to receive docetaxel is ongoing (NCT02111577). Some of the active and recruiting trials of combining vaccines with other agents for advanced prostate cancer are listed in [Table 1]. The most important and widely studied checkpoint molecules include programmed cell death protein 1 (PD-1) receptor (found on activated/cytotoxic T-cells), programmed cell death ligand 1 and 2 (PD-L1, PDL-2) expressed by tumor cells (advanced or metastatic stage), and cytotoxic T-lymphocyte-associated antigen 4 (CTLA-4). These checkpoints have an inhibitory effect on T-cell function and increase the evasion of tumor cells from the immune system. Thus, inhibiting these immune checkpoints removes their inhibitory effects on T-cells and facilitates antitumor activity by recognition of tumor cells as nonself. CD 28 is expressed by T-cells and binds to B7-1 and B7-2 receptors which are present on tumor cells and APCs to facilitate antitumor effects. CTLA-4 is expressed on activated T-cells and T regulatory cells, and it also competitively binds to B7-1 and B7-2 receptors to block the antitumor immune response. Blocking the CTLA-4 T-cell surface protein releases the suppressive effect of the B7 ligands and bypasses the immune checkpoint. Ipilimumab, a fully human anti-CTLA-4 monoclonal antibody (mAb), was the first checkpoint inhibitor to show clinical activity against melanoma. In a Phase III clinical trial, men with mCRPC with disease progression after docetaxel received ipilimumab and radiation therapy to the bones. This trial did not show an improvement in OS and only demonstrated a modest improvement in progression-free survival. However, in a subset of patients without visceral metastases and favorable laboratory values, a significant improvement in OS was reported (ipilimumab, 22.7 months; control, 15.8 months, HR 0.62; 95% CI: 0.45–0.86; P = 0.0038). In another Phase III trial, chemotherapy-naïve men with mCRPC were treated with higher doses of ipilimumab. There was no difference in the OS noted, but there was a modest improvement in remission-free survival. This trial failed to confirm the benefits noted in the previous trial in men with favorable disease characteristics that were seen in the previous study. To study the immune response mechanism, Gao et al. treated presurgical prostate cancer patients with ipilimumab and noticed that the treated tumors had scientifically increased activated T-cell infiltration into the tissue but none of these patients had a complete response to therapy. Through genomic and immune analysis of the resected tumors, they identified higher expression of immunosuppressive molecules, PD-L1 and VISTA, on tumor cells as well as T-cells and other immune cells. These findings lend further support to the idea that tumor cell and immune cell interaction is complex and the immune environment can change as a response to treatment. Based on these findings, the authors have devised a clinical trial to study the role of combination therapy with ipilimumab and nivolumab, and PD-L1 inhibitor to overcome the therapeutic resistance caused by overexpression of inhibitory pathways. Tremelimumab, another fully human anti-CTLA-4 mAb, has been studied in the setting of recurrent prostate cancer. In a Phase I dose escalation trial, tremelimumab was combined with short-term androgen deprivation therapy (ADT) in patients with biochemically recurrent prostate cancer. Interestingly, while no effect on the PSA level was noted initially, prolongation of the PSA doubling time was noted several months after completing the treatment. There are several ongoing trials of CTLA-4 inhibitors with either ADT or with other immune response modulators [Table 2]. After infiltrating the tumor environment and recognizing the tumor-associated antigens, the tumor-infiltrating lymphocytes secrete interferon gamma, which promotes the expression of PD-L1 in tumor cells, stromal cells, macrophages, and other white cells. Then, PD-1, which is present on the surface of T-lymphocytes, interacts with the PD-L1 present in the tumor microenvironment. This inhibits the normal immune response by suppressing the T-cell receptor signaling and giving an anti-apoptotic signal to cancer cells, thus promoting cancer cell survival. Another phenomenon, termed T-cell exhaustion, emerges as a result of repeated exposure of T-cells to tumor-associated antigens and sustained PD-1 expression. Sustained PD-1 and PD-L1 expression and interaction result in an immunosuppressive signal to T-cells and an anti-apoptotic signal to tumor cells, which results in the suppression of immune response and prolonged tumor cell survival. At present, there are a large number of ongoing clinical trials to evaluate the role of PD-1 and PD-L1 antibodies in mCRPC and hormone-sensitive prostate cancer, either alone or in combination with other modalities [Table 2]. The beneficial effects of combining immunotherapy with other treatment modalities are being considered in a number of trials, in both hormone-sensitive and castration-resistant prostate cancer. Many therapies have demonstrated potential for benefit but treatment responses have been variable, thus combining different interventions to increase the antitumor response seems desirable. These combinations have included immune checkpoint inhibitors with vaccines, chemotherapy, radiation therapy, focal ablation treatments, surgery, and ADT. An area of significant interest in the field of anticancer immunotherapy is to identify markers of response to therapy, which includes evaluation of PD-L1 expression on prostate cancer cells. It has been demonstrated in other solid tumors that express PD-L1 show an improved response to anti-PD-L1 therapy. However, the optimum extent of PD-L1 expression, most appropriate technique for measurement, and exactly which tissues to use when testing tumor samples have not been clearly defined for prostate cancer. In other tumor types, it has been demonstrated that microsatellite instability and tumor mutational burden (TMB) can predict response to immune checkpoint inhibitors. In mCRPC, about 6% of tumor samples demonstrated TMB, while 18% of melanoma and 8% of bladder cancer specimens demonstrated TMB. The TMB may be subject to change over the full spectrum of the disease, especially in response to various treatments over time, and ultimately may be an important determinant of therapy response. In contradistinction to cytotoxic or androgen suppression therapy, clinical trials in other solid tumors have demonstrated that the best response to immunotherapy was noted in patients with less advanced disease. The PROSTVAC-VF vaccine was shown to be more effective in patients with less aggressive disease. Similarly, sipuleucel-T demonstrated improved outcome in patients with earlier disease and less tumor burden. This information can help facilitate the identification of the most appropriate patients for studying the effectiveness of immune checkpoint inhibitors. Other unique and difficult-to-define features of immunotherapy are the timing and duration of therapy and the definition of clinical response. As mentioned above, the maximal clinical response can often be seen months after the end of the treatment. With a number of immune-modulating therapies, such as anti-CTL A-4 antibodies, sipuleucel-T, and PROSTVAC-VF, the response to treatment has been delayed by as much as 6 months, and the peak response has appeared 2–3 years after treatment., Since the OS end point can require additional time and resources, it is a common practice to use surrogate or intermediate end points (e.g., PSA level or progression-free survival) to assess the response to therapy. Recent trials of various immunotherapies including immune checkpoint inhibitors have revealed that an overall survival benefit in favor of the treatment arm can be achieved without measurable effect on the currently used surrogate end points. This has practical implications for clinical trial design, duration of treatment, measuring disease response, and defining a successful outcome. Immunotherapy has far-reaching potential to treat the full spectrum of prostate cancer ranging from localized disease to mCRPC, but efficacy must first be demonstrated and cost must be addressed. Further work into modifying the tumor microenvironment to be more responsive to a primed immune system will also be important. The future direction of immunotherapy in the treatment of prostate cancer must address several clinical problems, including selecting appropriate patients and most responsive disease status, determining the dose and duration of therapy, defining clinically relevant outcomes, refinement of combination therapies, and identification of biomarkers of treatment response as well as markers of resistance to immunomodulation. The future of prostate cancer immunotherapy is promising, but there are many obstacles left to overcome. Prostate cancer has several unique features that make it quite suitable for immunotherapeutic approaches. The timing and sequencing of various therapies for prostate cancer requires special consideration. It is apparent that the immune modulation may be best suited for less advanced and slowly progressing cancers. Thus, implementing immunotherapeutic approaches earlier in the prostate cancer disease spectrum would seem to be most appropriate. The standard outcome measures and the assessment of response to therapy used for other therapies are not valid for immunotherapy response measurement. It seems that a combination of immunomodulation approaches such a vaccine and checkpoint inhibitor or the use of two different checkpoint inhibitors (to counteract the resistance to one agent) would be required to realize the desired antitumor effects. Both authors declared no competing interests. Torre LA, Bray F, Siegel RL, Ferlay J, Lortet-Tieulent J, et al. Global cancer statistics, 2012. CA Cancer J Clin 2015; 65: 87–108. Guinney J, Wang T, Laajala TD, Winner KK, Bare JC, et al. Prediction of overall survival for patients with metastatic castration-resistant prostate cancer: development of a prognostic model through a crowdsourced challenge with open clinical trial data. Lancet Oncol 2017; 18: 132–42. Buttigliero C, Tucci M, Bertaglia V, Vignani F, Bironzo P, et al. Understanding and overcoming the mechanisms of primary and acquired resistance to abiraterone and enzalutamide in castration resistant prostate cancer. Cancer Treat Rev 2015; 41: 884–92. Drake CG. Prostate cancer as a model for tumour immunotherapy. Nat Rev Immunol 2010; 10: 580–93. Sfanos KS, De Marzo AM. Prostate cancer and inflammation: the evidence. Histopathology 2012; 60: 199–215. Hussein MR, Al-Assiri M, Musalam AO. Phenotypic characterization of the infiltrating immune cells in normal prostate, benign nodular prostatic hyperplasia and prostatic adenocarcinoma. Exp Mol Pathol 2009; 86: 108–13. Kiessling A, Füssel S, Wehner R, Bachmann M, Wirth MP, et al. Advances in specific immunotherapy for prostate cancer. Eur Urol 2008; 53: 694–708. Pasero C, Gravis G, Guerin M, Granjeaud S, Thomassin-Piana J, et al. Inherent and tumor-driven immune tolerance in the prostate microenvironment impairs natural killer cell antitumor activity. Cancer Res 2016; 76: 2153–65. Ardiani A, Gameiro SR, Kwilas AR, Donahue RN, Hodge JW. Androgen deprivation therapy sensitizes prostate cancer cells to T-cell killing through androgen receptor dependent modulation of the apoptotic pathway. Oncotarget 2014; 5: 9335–48. Thoma C. Prostate cancer: towards effective combination of ADT and immunotherapy. Nat Rev Urol 2016; 13: 300. Kantoff PW, Higano CS, Shore ND, Berger ER, Small EJ, et al. Sipuleucel-T immunotherapy for castration-resistant prostate cancer. N Engl J Med 2010; 363: 411–22. Higano CS, Schellhammer PF, Small EJ, Burch PA, Nemunaitis J, et al. Integrated data from 2 randomized, double-blind, placebo-controlled, phase 3 trials of active cellular immunotherapy with sipuleucel-T in advanced prostate cancer. Cancer 2009; 115: 3670–9. Hall SJ, Klotz L, Pantuck AJ, George DJ, Whitmore JB, et al. Integrated safety data from 4 randomized, double-blind, controlled trials of autologous cellular immunotherapy with sipuleucel-T in patients with prostate cancer. J Urol 2011; 186: 877–81. Small EJ, Lance RS, Gardner TA, Karsh LI, Fong L, et al. A randomized phase II trial of sipuleucel-T with concurrent versus sequential abiraterone acetate plus prednisone in metastatic castration-resistant prostate cancer. Clin Cancer Res 2015; 21: 3862–9. Small EJ, Sacks N, Nemunaitis J, Urba WJ, Dula E, et al. Granulocyte macrophage colony-stimulating factor-secreting allogeneic cellular immunotherapy for hormone-refractory prostate cancer. Clin Cancer Res 2007; 13: 3883–91. Higano CS, Corman JM, Smith DC, Centeno AS, Steidle CP, et al. Phase 1/2 dose-escalation study of a GM-CSF-secreting, allogeneic, cellular immunotherapy for metastatic hormone-refractory prostate cancer. Cancer 2008; 113: 975–84. Mandl SJ, Rountree RB, Dela Cruz TB, Foy SP, Cote JJ, et al. Elucidating immunologic mechanisms of PROSTVAC cancer immunotherapy. J Immunother Cancer 2014; 2: 34. Madan RA, Arlen PM, Mohebtash M, Hodge JW, Gulley JL. Prostvac-VF: a vector-based vaccine targeting PSA in prostate cancer. Expert Opin Investig Drugs 2009; 18: 1001–11. DiPaola RS, Chen YH, Bubley GJ, Stein MN, Hahn NM, et al. A national multicenter phase 2 Study of Prostate-specific Antigen (PSA) pox virus vaccine with sequential androgen ablation therapy in patients with PSA progression: ECOG 9802. Eur Urol 2015; 68: 365–71. Kantoff PW, Schuetz TJ, Blumenstein BA, Glode LM, Bilhartz DL, et al. Overall survival analysis of a phase II randomized controlled trial of a Poxviral-based PSA-targeted immunotherapy in metastatic castration-resistant prostate cancer. J Clin Oncol 2010; 28: 1099–105. Becker JT, Olson BM, Johnson LE, Davies JG, Dunphy EJ, et al. DNA vaccine encoding prostatic acid phosphatase (PAP) elicits long-term T-cell responses in patients with recurrent prostate cancer. J Immunother 2010; 33: 639–47. Noguchi M, Moriya F, Koga N, Matsueda S, Sasada T, et al. A randomized phase II clinical trial of personalized peptide vaccination with metronomic low-dose cyclophosphamide in patients with metastatic castration-resistant prostate cancer. Cancer Immunol Immunother 2016; 65: 151–60. Podrazil M, Horvath R, Becht E, Rozkova D, Bilkova P, et al. Phase I/II clinical trial of dendritic-cell based immunotherapy (DCVAC/PCa) combined with chemotherapy in patients with metastatic, castration-resistant prostate cancer. Oncotarget 2015; 6: 18192–205. Chambers CA, Kuhns MS, Egen JG, Allison JP. CTLA-4-mediated inhibition in regulation of T cell responses: mechanisms and manipulation in tumor immunotherapy. Annu Rev Immunol 2001; 19: 565–94. Kwon ED, Drake CG, Scher HI, Fizazi K, Bossi A, et al. Ipilimumab versus placebo after radiotherapy in patients with metastatic castration-resistant prostate cancer that had progressed after docetaxel chemotherapy (CA184-043): a multicentre, randomised, double-blind, phase 3 trial. Lancet Oncol 2014; 15: 700–12. Beer TM, Kwon ED, Drake CG, Fizazi K, Logothetis C, et al. Randomized, double-blind, phase III trial of ipilimumab versus placebo in asymptomatic or minimally symptomatic patients with metastatic chemotherapy-naive castration-resistant prostate cancer. J Clin Oncol 2017; 35: 40–7. Gao J, Ward JF, Pettaway CA, Shi LZ, Subudhi SK, et al. VISTA is an inhibitory immune checkpoint that is increased after ipilimumab therapy in patients with prostate cancer. Nat Med 2017; 23: 551–5. McNeel DG, Smith HA, Eickhoff JC, Lang JM, Staab MJ, et al. Phase I trial of tremelimumab in combination with short-term androgen deprivation in patients with PSA-recurrent prostate cancer. Cancer Immunol Immunother 2012; 61: 1137–47. Chen L, Han X. Anti-PD-1/PD-L1 therapy of human cancer: past, present, and future. J Clin Invest 2015; 125: 3384–91. Iwai Y, Ishida M, Tanaka Y, Okazaki T, Honjo T, et al. Involvement of PD-L1 on tumor cells in the escape from host immune system and tumor immunotherapy by PD-L1 blockade. Proc Natl Acad Sci U S A 2002; 99: 12293–7. Carosella ED, Ploussard G, LeMaoult J, Desgrandchamps F. A systematic review of immunotherapy in urologic cancer: evolving roles for targeting of CTLA-4, PD-1/PD-L1, and HLA-G. Eur Urol 2015; 68: 267–79. Graff JN, Alumkal JJ, Drake CG, Thomas GV, Redmond WL, et al. First evidence of significant clinical activity of PD-1 inhibitors in metastatic, castration resistant prostate cancer (mCRPC). Ann Oncol 2016; 27 Suppl 6. Hansen A, Massard C, Ott PA, Haas N, Lopez J, et al. Pembrolizumab for patients with advanced prostate adenocarcinoma: preliminary results from the KEYNOTE-028 study. Ann Oncol 2016; 27 Suppl 6. Callea M, Albiges L, Gupta M, Cheng SC, Genega EM, et al. Differential expression of PD-L1 between primary and metastatic sites in clear-cell renal cell carcinoma. 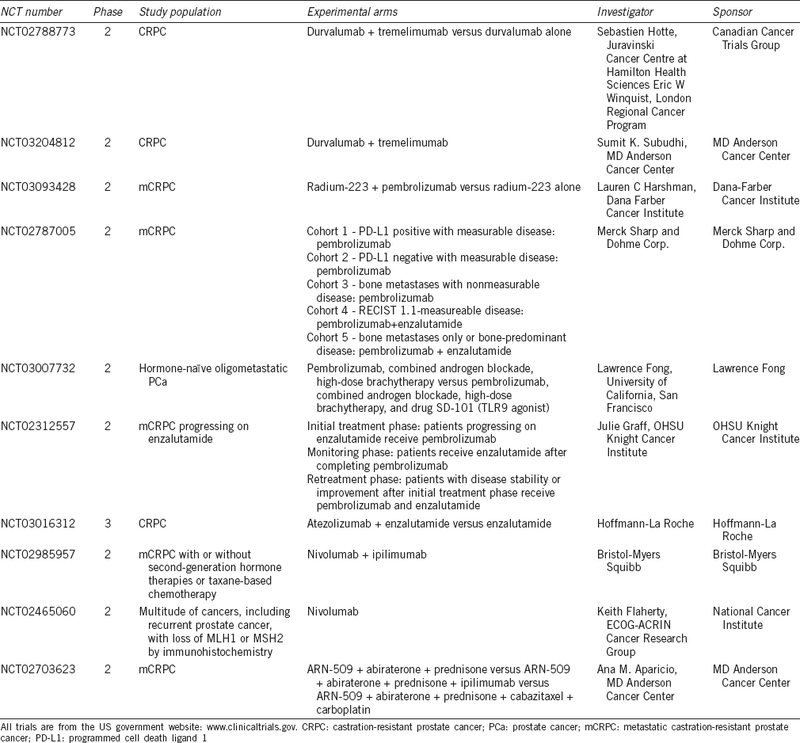 Cancer Immunol Res 2015; 3: 1158–64. Chalmers ZR, Connelly CF, Fabrizio D, Gay L, Ali SM, et al. Analysis of 100,000 human cancer genomes reveals the landscape of tumor mutational burden. Genome Med 2017; 9: 34. Halabi S, Small EJ, Kantoff PW, Kattan MW, Kaplan EB, et al. Prognostic model for predicting survival in men with hormone-refractory metastatic prostate cancer. J Clin Oncol 2003; 21: 1232–7. Schellhammer PF, Chodak G, Whitmore JB, Sims R, Frohlich MW, et al. Lower baseline prostate-specific antigen is associated with a greater overall survival benefit from sipuleucel-T in the Immunotherapy for Prostate Adenocarcinoma Treatment (IMPACT) trial. Urology 2013; 81: 1297–302.